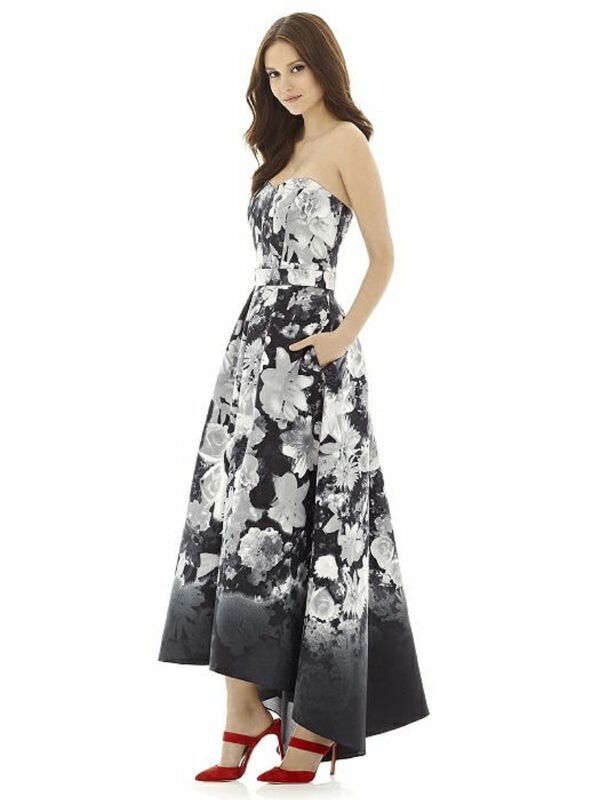 Alfred Sung style D699 FP is a full length strapless sateen twill dress with sweetheart neckline and hi-low hem detail. 1.5" self belt at natural waist. Belt always matches skirt. Pockets at side seams of pleated full skirt. This style is available in Blush Bouquet and White Bouquet print. Optional spaghetti straps included. Extra length is available in sizes 00-16 ONLY. See style D699 for solid version and D699 CP for combo floral print version. Shown in Bohemian Print. DELIVERY TIMES ARE ESTIMATES AND CAN VARY! "Special Promotions" "E-mail us for additional promotions on this dress!"